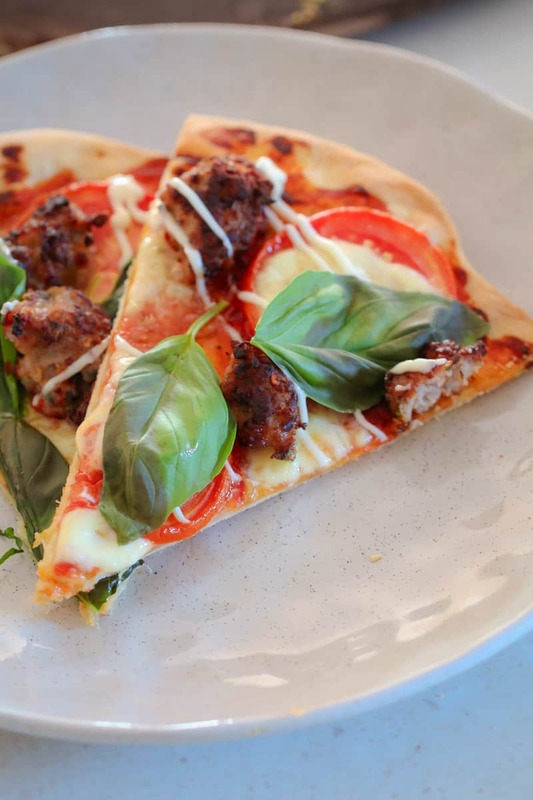 Introducing the ultimate crispy based Italian Pizza with Pork Sausage, Basil & Tomato! 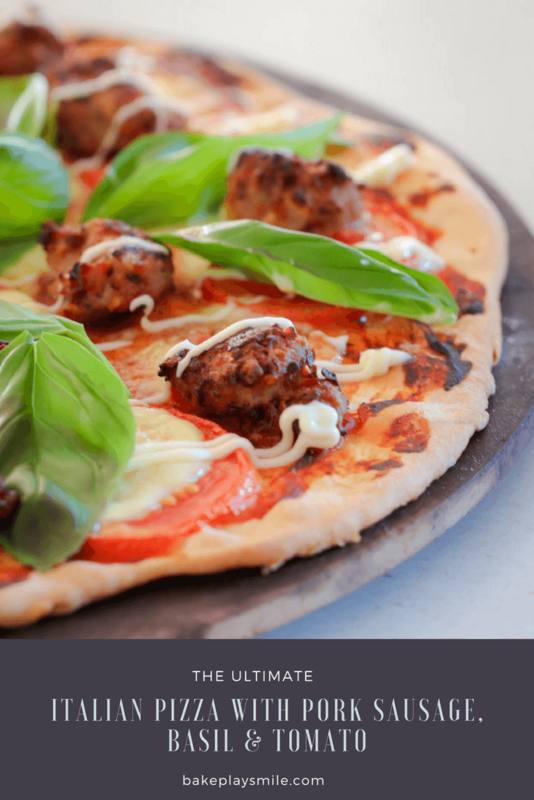 This delicious recipe is an absolute winner on pizza night!! Friday night pizza night is a tradition in our house! We LOVE pizza! 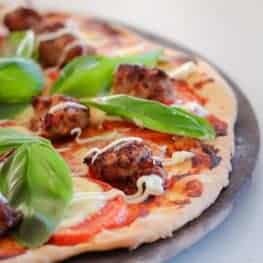 And this Italian Pizza with Pork Sausage, Basil & Tomato is the current favourite (and that’s saying a LOT!). 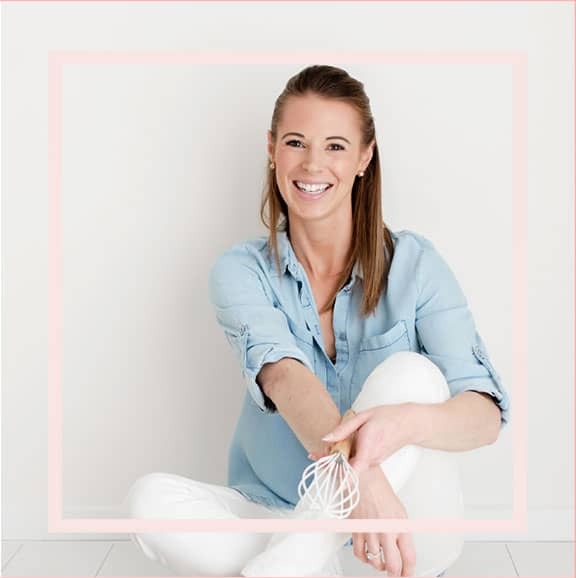 Anyway, pizza is definitely a big deal in our house (and I love it even more so because my hubby is the chief pizza maker round here… whoop whoop!). 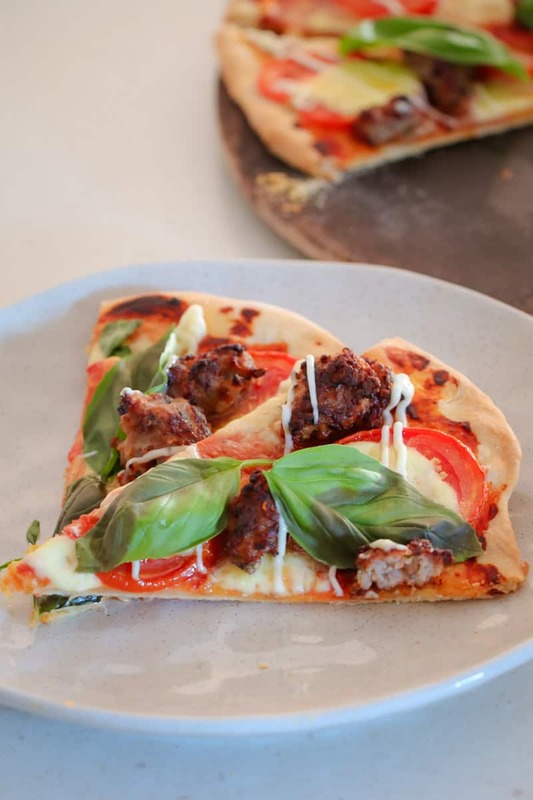 But back to this Italian Pizza with Pork Sausage, Basil & Tomato… it is seriously delicious! 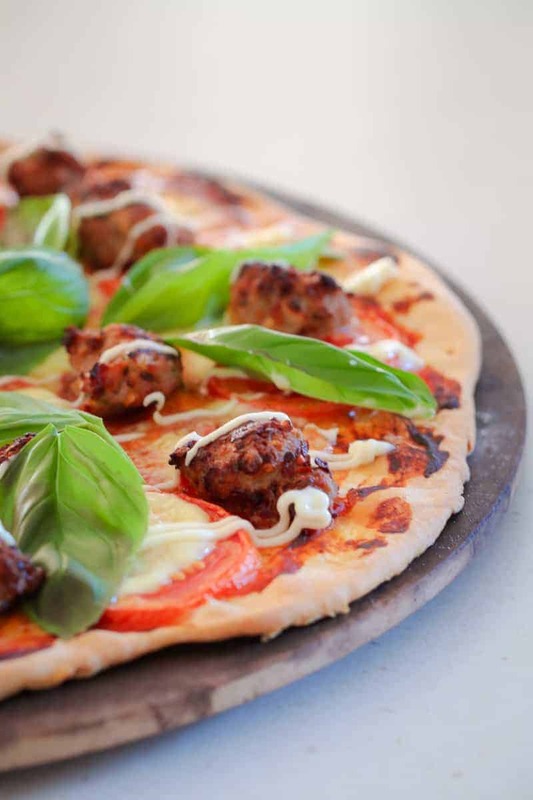 A crispy pizza base, Italian pork meatballs, bocconcini, fresh tomato and basil – and the secret ingredient – Kewpie mayo!!!! Trust me on this one. 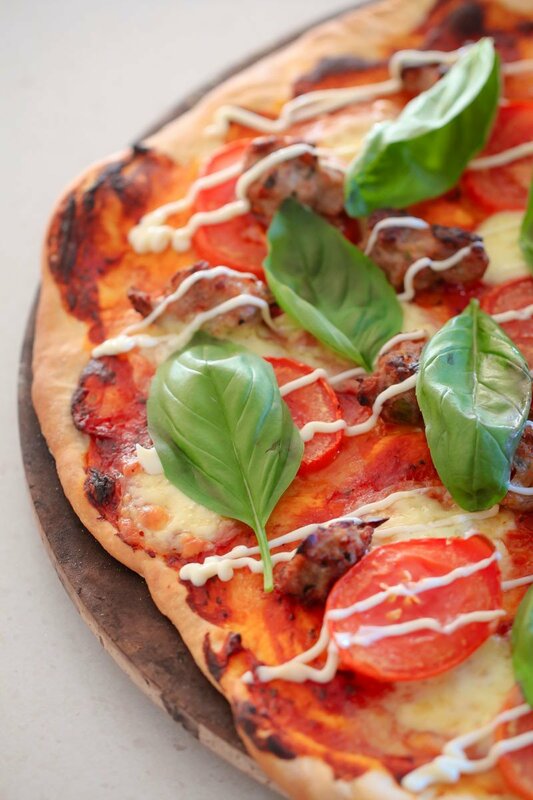 The Kewpie mayo takes this pizza to a whole new level. AMAZING!!! 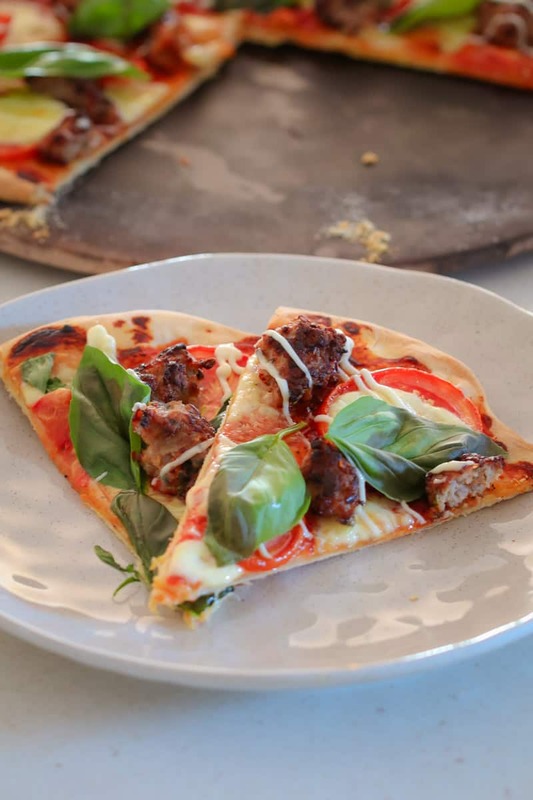 This Italian Pizza with Pork Sausage, Basil & Tomato is going to make your Friday night pizza night even more delicious than usual!!! Too make the dough, sift the flour into a bowl. Add the sugar, salt and oil. Put the yeast sachet into the warm water and leave for a few minutes (or until frothy). Mix together. Pour the yeast liquid into the flour and mix together (add more water if needed). Knead on a floured board into a ball. Place in a bowl floating in a sink of hot water (don't let any of the water into the bowl) and cover with a tea towel. Leave for 30 minutes to rise. Knead the dough on the floured board again. Roll out to make a large 32cm dough circle. Place the dough onto the tray and spread over the pizza sauce. Preheat oven to 220 degrees celsius (fan-forced). Squeeze the pork sausages out of the skin and mix on a bowl with the chilli flakes. Cook in a frying pan over medium-high heat in small balls until brown. Add the cooked pork and sliced tomatoes to the pizza and cook for 10 minutes (or until the base is almost cooked). Add the bocconcini and cook until melted and the base is crispy (approximately 5-10 minutes). Top with fresh basil and Kewpie mayo and serve immediately. This pizza dough will make enough for 1 large pizza and 4-5 mini pizzas. Kewpie (Japanese) mayo can be found in the Asian section of any major supermarket. To make the pizza dough, heat the yeast and water for 1 minute, 37 degrees, Speed 1. Add the sugar, plain flour, olive oil and salt and mix for 6 seconds, Speed 6. Knead for 1 and ½ minutes on interval speed. Place into a lightly greased Thermoserver (or bowl) and place into a warm spot for 30 minutes or until doubled in size). If using a bowl, make sure you cover it with a tea towel to keep the heat in.